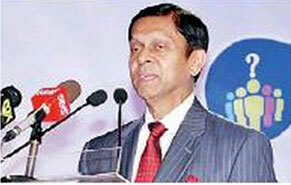 Central Bank (CB) Governor Ajith Nivard Cabraal urged the banking fraternity to shift from the traditional mind-set of collateralized lending to serve the financial needs of the emerging middle class.Speaking at the 26th anniversary convention of the Association of Professional Bankers of Sri Lanka, Cabraal stressed the importance of extending non-collateralized lending with ‘earnest’.“You also need to now look at moving away from collateral-based banking. I know, we have been talking about this for a long time but it is time now we do so with earnest,” he said.It was only recently MAS Holdings Chief Growth Officer Nathan Sivagananathan took a jab at Sri Lanka’s banking sector, which as the very first thing asks for collateral when asked for a loan by a prospective entrepreneur, who has a great commercial idea. He said the Lankan banks are ‘still old school’.Unlike in t he United States’ Silicon Valley, Sri Lanka is still in the infancy of creating an ecosystem with venture capitalists, angel investors, universities, technology companies and media, which give free publicity to nurture the business start-ups.However, banks have gradually shifted from pure collateralized lending based on i mmovable assets to movable assets, personal guarantors and further to assessing only the regular income earned by an individual borrower. However, still there is high rigidity in lending to the start-ups and small and medium enterprises (SMEs) due to the high level of risk associated with such lending without asset backing.The Governor further said that the country is currently seen a much deeper middle class, which contributes to the economic growth, as it has very high purchasing power. “I was told that by the end of this year, we would have five million internal domestic tourists – people who are travelling around the country,” he remarked. According to him, this transformation has further led to the emergence of new industries in the spheres of leisure, entertainment and beauty therapy. “Hardly a day goes by without an invitation for various functions and I like to see all the entertainment because I see the economics behind that.When you see these pretty girls that dance, you would see behind that is a massive industry- the costumes, the music, the transport, the training – all are part and parcel of the entertainment industry. If you look at the times when we were young, we used to go to a barber. But today nobody goes to a barber. They go to salons. They have all types of treatments – to the face, to the hair, to the cheeks, to the hands – all that are part and parcel of another industry,” said Cabraal, stressing that all these new sectors need banking support in terms of funding for their growth.